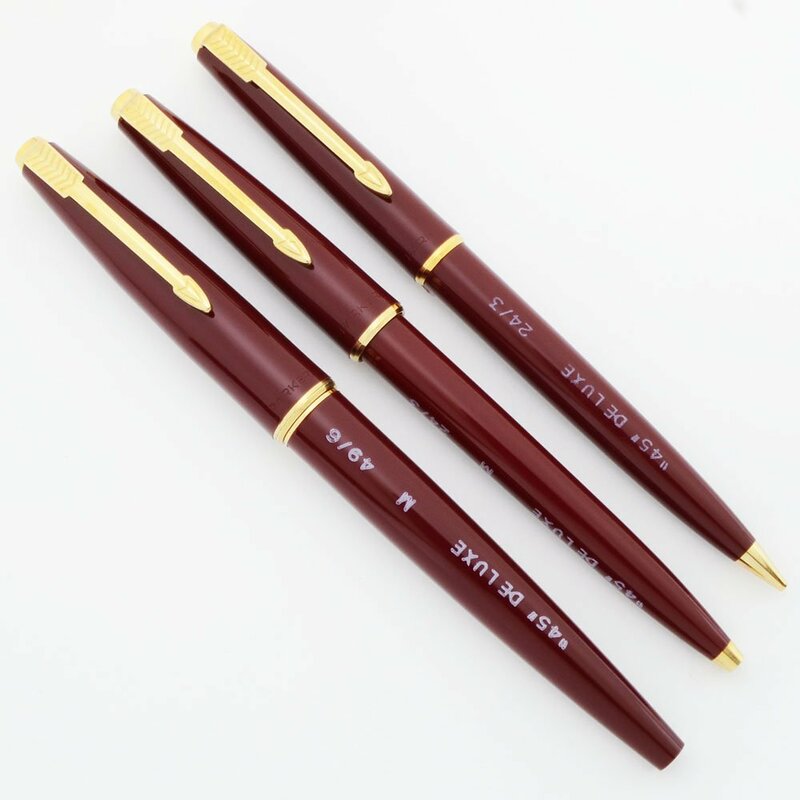 Parker 45 "Deluxe" 3 piece Set: fountain pen, ballpoint pen, and mechanical pencil. Gold-plated trim and red barrels and caps. Fountain pen is fitted with a medium left oblique 14k nib, an uncommon "Y" nib. New old stock condition with some light storage marks. Manufacturer and Year Parker, Made in England, pre-1970 based on concave conical clip screw. Length Fountain Pen: 5-3/8"; Ballpoint Pen: 5-3/16"; Mechanical Pencil: 5-1/16"
Filling System Fountain pen takes Parker cartridges, or can be used with the included vintage Parker squeeze converter. 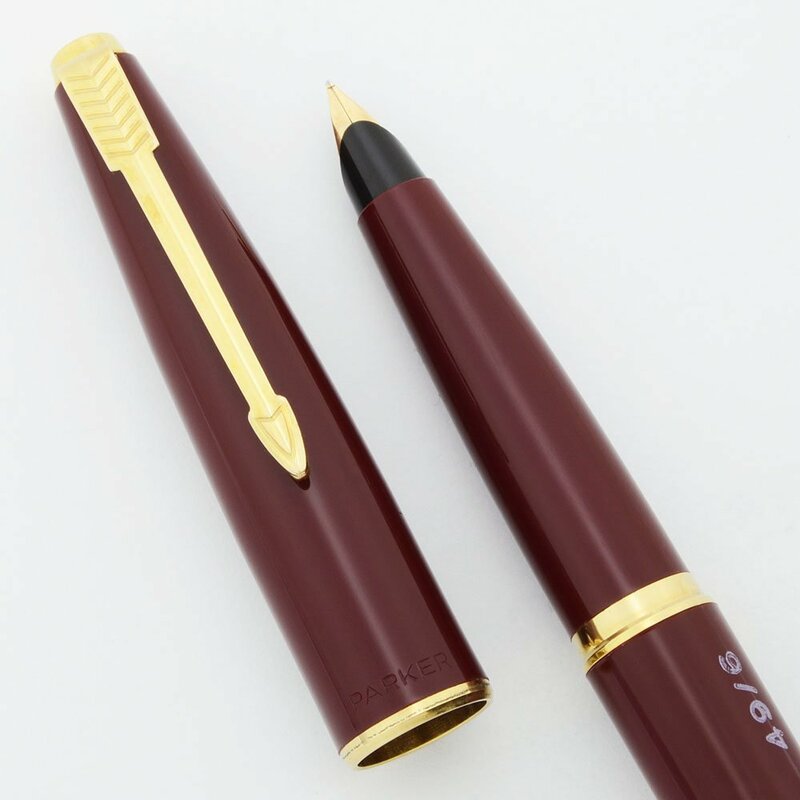 The ballpoint takes Parker-style ballpoint refills, and one is included. The pencil uses 0.9mm leads, which it extends via the traditional, twist-method. We'll include a packet of leads. Color Red (burgundy) barrels and caps, with gold-plated trim. 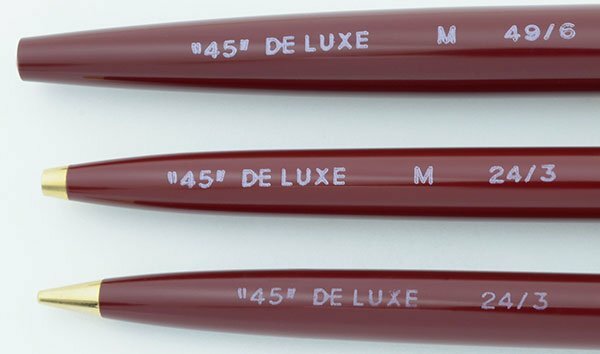 Original chalk marks are on the barrels, "45 Deluxe "
Nib 14k nib is a medium left oblique (there is an Y on the nib feed which matches the actual installed nib, however the chalkmark says M). Condition New old stock with light marks picked up in storage. All three pieces are in excellent condition with no damage. The fountain pen barrel and cap look great with just a few light scratch marks. The section has some long thin lines of scratching from capping. The clip and tassie look great. The ballpoint pen is very clean and shiny. The mechanical pencil has some scratching above the chalkmark and a few spots of plating wear on the top of the tassie. The three pieces make a shiny, lovely set and are all in excellent working order. The imprints on all three are clear.